The number of Chinese consumers making in-store mobile payments more than doubled last year and almost half of all smartphone users in the country will be making proximity mobile payments by 2020, according to research released by eMarketer. There will be 195.3m people using the technology in 2016, representing a 45.8% growth over last year, the company’s estimates of mobile payment usage in China also reveal. 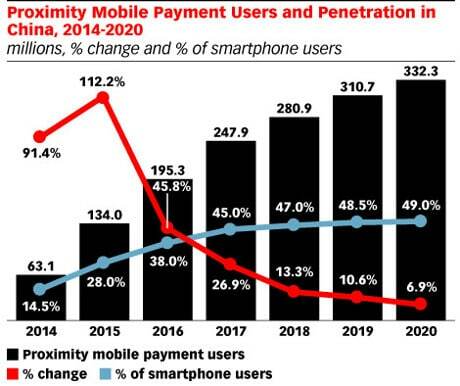 In comparison, the US will be home to 37.5m proximity mobile payment users this year. “In effect, China has jumped directly from cash to mobile payments,” the company adds. “In addition, urban areas in China have seen widespread adoption of Alipay and Tenpay. Also helping to drive the growth of proximity payments is the rising number of digital buyers in China making purchases on smartphones. “Despite having a higher penetration rate than the US, China’s proximity mobile payments market still remains largely untapped, with usage mostly in concentrated larger cities,” says Shelleen Shum, eMarketer forecasting analyst. “The challenge is to get retailers to upgrade their systems to accept mobile payment methods at the POS.